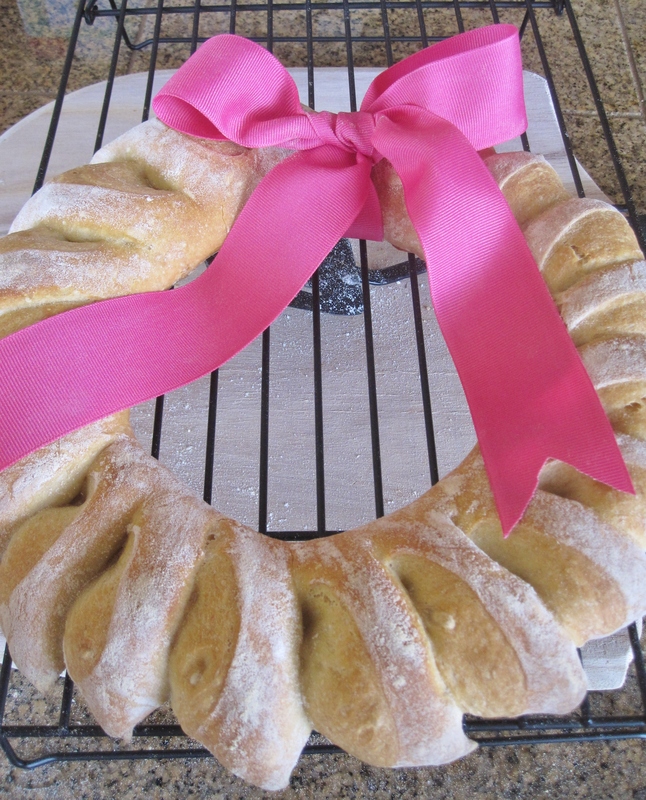 I baked two loaves of these wreath breads to give to the boys’ teachers as Christmas gifts. Just like my other artisan breads, it is made using stored bread dough. You might find it hard to believe, but I spent less (active) time making on this bread than on cookies. 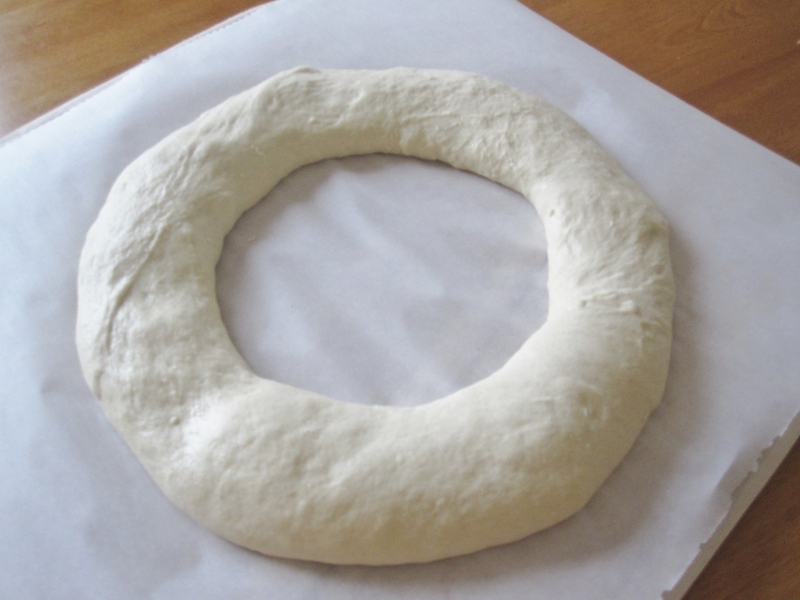 It may look difficult but it’s real simple to cut the dough to create the wreath pattern. On baking day take out chilled dough, sprinkle some flour on top of the dough then use one hand to pull up some dough (about size of grapefruit) while use the other hand to cut the dough with a pair of kitchen scissors. With dough in you hand, shape the dough into a ball or ‘boule’ by gently pull stretch the surface of the dough and tuck in the bottom, giving it a quarter turn as you pull/stretch. Dust a little more flour to prevent dough sticks to you hand. This shaping process should not take more than 1 minute. Hold the dough ball with both hands, then use your fingers or thumbs to poke through the center of the dough. Use both hands to stretch the hole wide open so it’s triple width of the wall of the ring. If the dough resists, let it rest for a few minutes to relax the gluten. Don’t fight with the dough. Be sure to dust work surface with flour to prevent dough from sticking. Place shaped dough on pizza peel lined with parchment paper, rest uncovered at room temperature for 1.5 hours or until the dough is no longer cold to the touch. 20 minutes before baking, place pizza stone on the middle rack and a shadow pan at the bottom rack. Then preheat oven temperature to 450°F. Before turning the dough into the oven, dust the top of the dough with flour generously and use your hand spread out flour evenly (this to to create a two tone pattern). Use a pair of kitchen scissors make a single snip on the dough at low shallow angle (maybe at 30° angle) to near bottom (take care not to cut the dough all the way through). 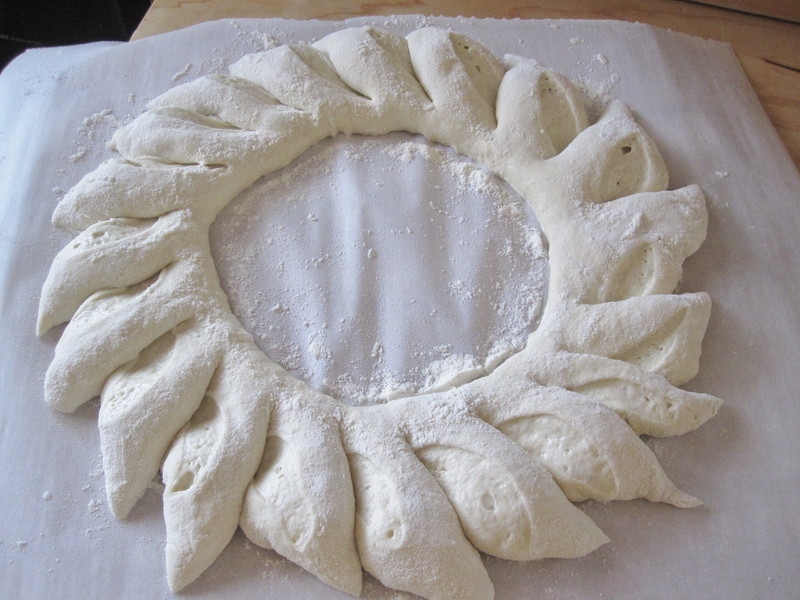 As you snip tilt the scissors outwards a little so the wreath points will show after baking. Continue snipping the dough all around. Quickly and carefully slide the dough with parchment paper onto the pizza stone. Pour 1 cup of water into the shadow pan then quickly close the oven door. Bake for 30 minutes until the bread is golden and tap hollow at the bottom of bread (I always bake the bread on stone for 29 minutes, remove water pan, and transfer the bread to the bottom rack and bake for 1 minute to crisp up the bottom crust). Remove bread from oven and cool immediately on a rack. Dress up the bread with your favorite holiday ribbon. You can also a combination of herbs and/or seeds alternatively to sprinkle on the bread to create a different look. To make the toppings stick to the dough, brush the dough with some water before sprinkling. 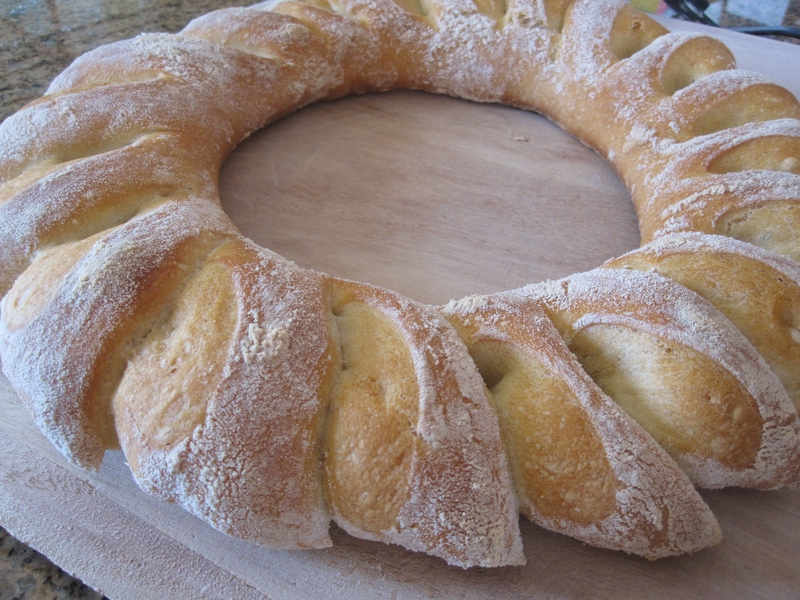 Wreath Bread Making-- snip! snip!